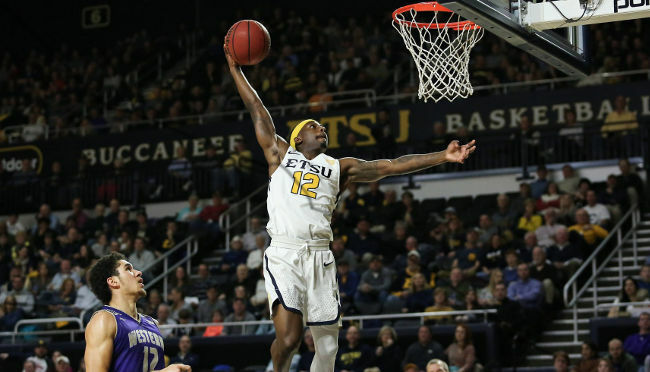 The ETSU men’s basketball team played two more big Socon games this week and came away with two more victories while extending their winning streak to 10 games. It’s the Bucs longest winning streak since the 2006-2007 season. ETSU also improved to 7-0 in the Socon, which is their best conference start since 2003-2004 when the Bucs started 15-0. With the win over Furman on Thursday night the Bucs became the only undefeated team in the Socon and their undefeated mark remained after beating Western Carolina on Saturday. The Bucs came into the Furman game with not winning at Timmons Arena since 2004 when it took a last second layup from Tim Smith to beat the Paladins 69-68. The game on Thursday night ended quite similarly to that 2004 game. The Bucs once again found themselves down a point in the final seconds against Furman and they looked to their senior leader Desonta Bradford to seal the win. Bradford drained a one handed floater with 4.5 seconds left to put the Bucs ahead 62-61. Furman was unable to make their final shot and ETSU came away with a hard fought win. It was a win that saw ETSU lead most of the game. The Bucs held a 12 point lead at one point in the 2nd half but Furman was able to crawl back and take the lead late. It was the Bucs defense that shined as they held Furman to just 36% shooting. The nine 3-point shots by ETSU was also a big factor in this win. Saturday’s game against Western saw ETSU jump out to a 11-0 lead and never look back. The Bucs took home a rather easy 66-50 victory over a very physical Catamount team. The ETSU defense continued to dominate limiting Western to only 50 points on 32% shooting. Amazingly the 50 points allowed is just the 3rd lowest by an ETSU opponent so far this season. Both VMI and Hiwassee scored only 48 against ETSU. The Bucs will look to continue their winning streak on Wednesday when they play Mercer for the 2nd time this year. The last outing saw ETSU win 74-55 in Macon. Mercer is coming into Wendesday’s game at 3-4 in the Socon after a tough overtime loss versus UNCG this weekend. Hopefully ETSU can build off the 5,412 fans that were at Freedom Hall for Western and fill Freedom vs Mercer! T.J Cromer scored 20 points and was 3-5 from the 3-point line including hitting the winning 3-point shot with 8 seconds left in the game. Cromer was not the only Buc that shot well from the 3-point line. As a whole ETSU tied a school record with 15 made 3-point shots. Ge’Lawn Guyn was 6-9 from the 3-point line with a career high 28 points and Lester Wilson shot 5-9 from beyond the arc with 17 points, which is a season high from Wilson. The Bucs played in front of 3,078 energetic Buc fans, which is the second highest attended home game of the year. The game featured 11 ties and 11 lead changes. ETSU fell behind early, trailing by 13 points, but ETSU quickly cut into that lead and outscored UNCG 32-18 to finish the first half to lead by one point at halftime. Neither team led by more than 5 points in the 2nd half and UNCG led by four with 2:18 left in the game, but ETSU was able to come away with the win thanks to Guyn’s and Cromer’s 3-point shooting late in the game. ETSU will be back in action at Freedom Hall on Monday night, taking on SoCon foe VMI at 6 p.m.
Below are two different perspectives of the winning shot from last nights game. Senior guard Deuce Bello made the SportsCenter Top 10 last night with a big dunk off a missed shot from GeLawn Guyn. The dunk came in at #5 on the countdown for the day. 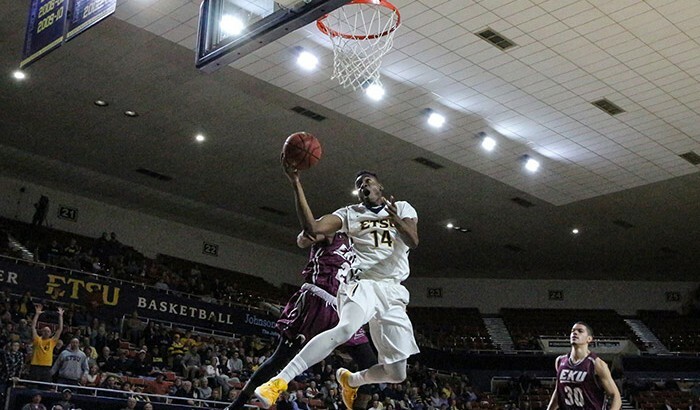 Additionally, the dunk came at a perfect time as ETSU was tied with Eastern Kentucky 71-71 before the dunk. It’s the second time this year that ETSU has made the SportsCenter top 10, the other time came against Wisconsin-Green when A.J. Merriweather made the top 10 highlights. ETSU went on to win 87-81 to improve to 5-5 on the year. The Bucs next game will be Tuesday night in Knoxville win they take on Tennessee. 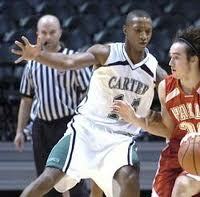 Sophomore guard A.J. Merriweather gave us Buc fans plenty of exciting moments this year. Here are the 3 most impressive dunk highlights of the season from A.J. Merriweather. With two years left at ETSU I’m sure we’ll be seeing more of Mr. Merriweather in the next two seasons. 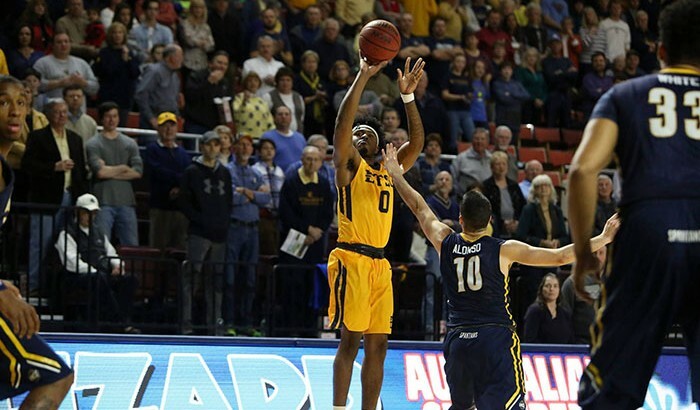 Here are some highlights from ETSU’s 79-70 win last night against Kennesaw State. The Bucs won their second game in a row last night for the first time all season long behind John Walton’s career high of 23 points and 3 blocks and 22 points for Jarvis Jones. It was great to see John Walton have a breakout game for us but at the same time I’m still a little disappointed in Lester Wilson’s lack of playing time. The Bucs next play on Saturday at 4PM against Mercer inside the dome. Hopefully the Bucs can make it three in a row! I’ve seen a lot of Buc comebacks in my time but this game has to be one of the craziest. While the Bucs did not play well most of the game they fought back after being down 20 points with 10 minutes left in the game and hit a huge 3-pointer with 5.5 seconds left to beat Stetson. The Bucs next play on Thursday night versus KSU in Johnson City. Highlights from ETSU’s exciting 59 -57 win against Charleston Southern last night, including John Walton’s game winning shot. This short highlight reel of Lester Wilson comes from one of our readers who provided me the video. This video showcases Lester’s tremendous athletic ability with some outstanding dunks and blocks during a Carter HS game. I’m certainly excited about seeing Lester Wilson in an ETSU uniform after watching this and other previously posted videos of Lester.